If you read any major blog over the past week or so, you undoubtedly know that several credit cards have new, increased signup offers. Instead of rehashing them individually in separate posts, I am going to rank them all in a single post and give my quick thoughts on each one. And since I don’t have affiliate links or have to worry about selling these cards to you, I can give you my honest opinion about each offer. 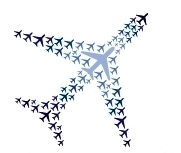 Offer Details – You will earn 70,000 United miles if you are targeted (try this link with the $50 statement credit and this link without the $50 statement credit) or 50,000 miles (that link is a publicly available offer) for spending $3,000 in 3 months. You will also earn 5,000 miles for adding an authorized user in all cases. The annual fee of $95 is waived for the first year on the targeted offer with the $50 statement credit but not waived on the other targeted offer or the public offer. Verdict – There are 3 separate offers now on this card and while it is targeted, the 75k offer + $50 statement credit with no first year annual fee is by far the best offer on this card and in my opinion of the best current signup bonuses on any card on the market right now. The 75k offer without the statement credit & the public 55k offer are still upgraded offers over the old public signup bonus of 35k and worth applying for in my opinion. United miles are among my favorite miles for travel to Europe and Asia due to the wide array of partners in Star Alliance and you can easily supplement United miles with Chase UR points. The only big downside with these offers is that the public offer is subject to Chase’s 5/24 rules while it is unclear if the targeted offers are (there are mixed reports that if you are targeted for an offer you might get around Chase’s 5/24 rule). If you violate the 5/24 rule for the public offer, than unfortunately you must pass on this card. If you are targeted for one of those offers, be prepared for the possibility of a denial thought it is not guaranteed. Offer Details – You will earn 30,000 Alaska MileagePlan miles + a $100 Statement credit for spending $1,000 in 3 months. The annual fee of $75 is NOT waived for the first year. Direct link to offer. Verdict – Previously the best publicly available offer was 25,000 miles + a $100 statement so it’s nice to see the offer increase by 5,000 miles. The annual fee is covered with the statement credit so BofA is paying you $25 for every 30,000 Alaska miles you earn. 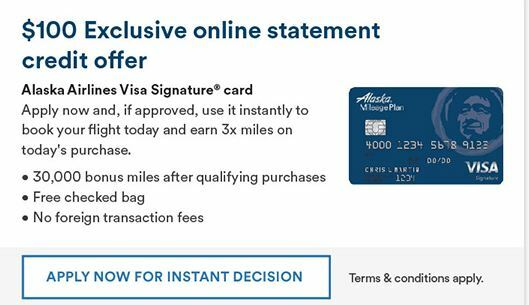 Notice how I said every 30,000 Alaska miles you can earn – this card is churnable and while I won’t go into specific in this post, it’s fairly easy to signup for 3+ of these cards every year. More if you include the business credit card version (though that card is still at just a 25,000 mile signup bonus). Even with the recent devaluation of Emirates awards using Alaska miles, there is still good value in this program. You can book AA and Delta awards in addition to other high value awards such as Cathay Pacific, Fiji Airways and Hainan. Updated (6/5): There is a better offer of 50,000 SkyMiles + $100 statement credit if you go to Delta.com and shop for a flight. Before you reach the final payment page, you should see an ad on the page for this offer. As such, there is no direct link to this offer. Offer Details – You will earn 50,000 Delta SkyMiles for spending $2,000 in 3 months + a $50 statement credit for your first Delta purchase. The annual fee of $95 is waived for the first year. Direct link to offer. Verdict – This is a fairly common offer from Amex on this card and it’s not a bad one if you want to increase your Delta SkyMiles balance. There is no fee for the first year and it’s always good to have another Amex card for Amex Offers. But on the other hand, Delta SkyMiles are easily the worst miles out of the 3 big legacy US airlines and there is a reason some people called them SkyPesos. There is value here but have a plan as to why you want to increase your Delta SkyMiles balance. Offer Details – You will earn 60,000 Delta SkyMiles & 10,000 Mediallion Qualifying Miles for spending $2,000 in 3 months + a $100 statement credit for your first Delta purchase. The annual fee of $195 is NOT waived for the first year. Direct link to offer. This offer is also available on the business version of this card as well. Verdict – Unless you chase status with Delta (you can earn an additional 10k MQMs for spending $25k on this card) I can’t see why you would choose the Platinum Delta card over the Gold Delta card. You are paying $195 in annual fees for an extra 10,000 miles. If you’ve had almost every other Amex card, then I’d guess I’d consider paying $195 for 60,000 miles as the miles are worth ~$600 to me but still not an amazing offer unless you care about Delta status. My thoughts about SkyMiles in the above offer obviously hold true here as well. Offer Details – You will earn 60,000 American Airlines Miles for spending $5,000 in 3 months. The annual fee of $450 is NOT waived for the first year. This card also comes with AA Admirals Club membership. Direct link to offer. Verdict – I don’t get the hoopla with this increased offer. The normal signup bonus is 50,000 miles so it is only a 10,000 mile increase and in the past we have seen both a 100,000 mile and 75,000 mile offer. Why settle for just 60,000 miles? Unless you really plan to use the AA Admirals Club membership for lounge access (and there is a better Citi card to get if you want AA lounge access), you are still out of pocket $450 for 60,000 miles. This offer is a major pass for me. While I believe my above thoughts hold true for most people, I do offer a consulting service where you work one on one with me to get customized opinions and unbiased advice. Remember when other bloggers send out alerts for some offers on this list (you all know who I am talking about) but fail to mention some of the other increased offers on this list, its because they are focusing on their bottom line with affiliate links and not caring about your bottom line. I don’t have any BoA cards and was thinking about applying to both the 30k and 25k offers in the same day. Seems like there are limited DPs regarding multiple apps since the new link was released. Any thoughts/advice on whether this is worth a shot? I haven’t done it with the new offer but last month I applied for both a personal and business at same time with no issue. There’s also the Gold Delta SkyMiles *Business* Credit Card from American Express with the same 50K bonus as the personal version of the card.